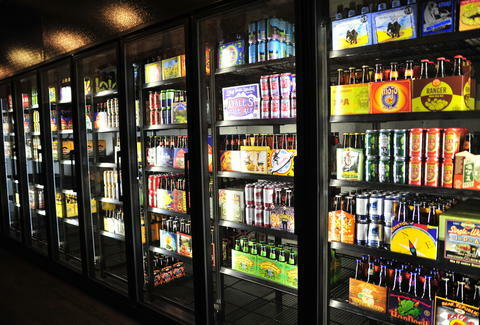 70% of the beers are from Colorado brewers, while the other 30% are out-of-state crafts. You could say they're COhabitating, lol. Every last bottle of liqueur and vino is from in-state distilleries and wineries. Expect to see bottles/ cans from big guys like Oskar Blues & Left Hand, up-and-comers like Ska Brewing and Crazy Mountain, and total noobs like Renegade Brewing, who just recently began canning. 2 Rivers leads the local wine cull, while hard booze counts everything from Stranahan's, to Leopold Bros, Dancing Pines, and 291 Distillery's aged whiskeys, previously not available in Denver. Even the mixers are local, like margarita/ mojito/ jalapeno bloody mary bases from Top Shelf, also where a hilarious bartender would ironically keep his Rumple Minze in jest.